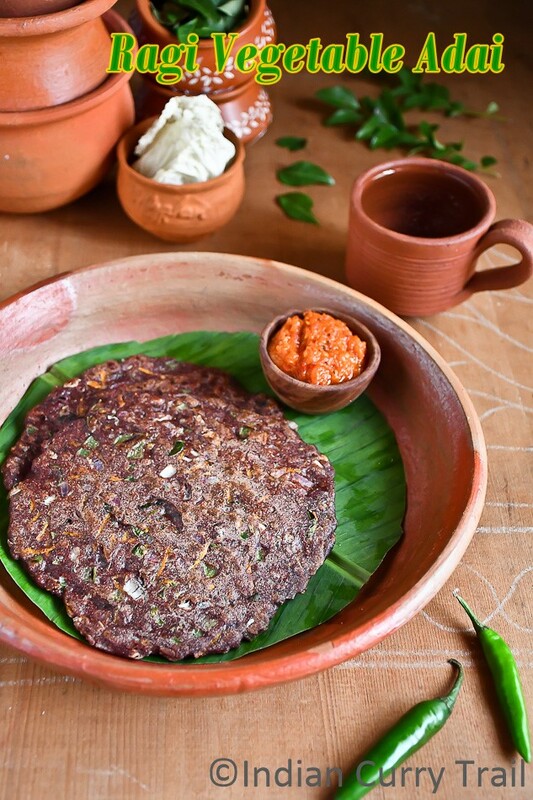 Ragi Vegetable Adai is a healthy, tasty adai that can be eaten as a snack or as a breakfast/dinner option. It can be eaten as it is or served with spicy condiment. It is one of the best way to consume ragi to gain all the benefits of ragi. The video recipe is given below. Please subscribe for more cooking videos from Indian Curry Trail you tube channel. 1) Heat 3 teaspoons of oil in a wide pan. 3) Add curry leaves, coriander leaves, green chillie and ginger. Saute it for a minute. 4) Add onion and saute till it becomes translucent. 5) Add carrot, cabbage, capsicum. Stir well and cook till the vegetables become soft. 6) Once the vegetable are cooked well, turn the flame off and cool down this mixture. 7) Once the vegetable is cooled down, add the ragi flour and salt to taste to the same pan. 8) Add required water and make a soft, little loose dough. 9) Pinch a tennis size ball and place it over the banana leaf. Instead of Banana leaf, damp cloth or butter paper can be used. 10) Pat the dough using the wet hand and make adai with uniform thickness. 11) Transfer it to the dosa pan/hot griddle. Smear the oil over the adai. Pour oil to the edges of adai if required. 12) Turn or Flip it to cook the other side of the adai. 13) Repeat the steps 9 to 12 with rest of the dough. 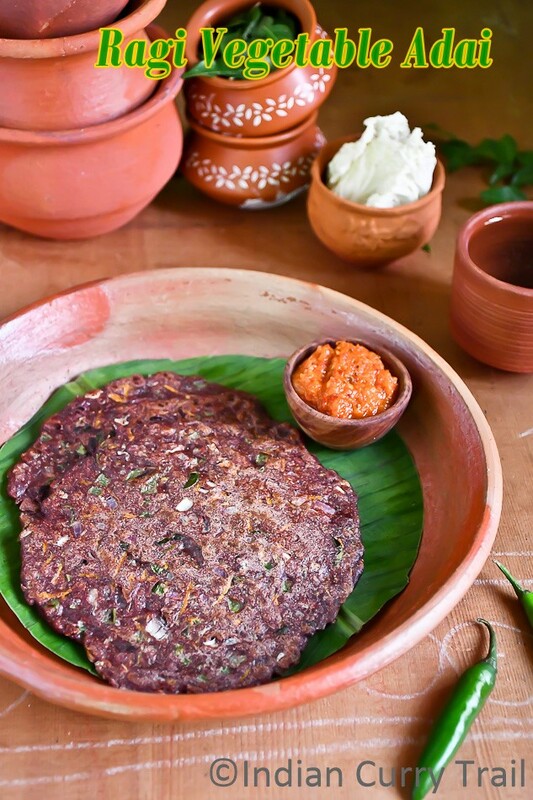 Serve Ragi Vegetable Adai with Spicy tomato chutney for the breakfast or for dinner. 1) Vegetables can be customized according to personal preference. Make sure to chop it finely. 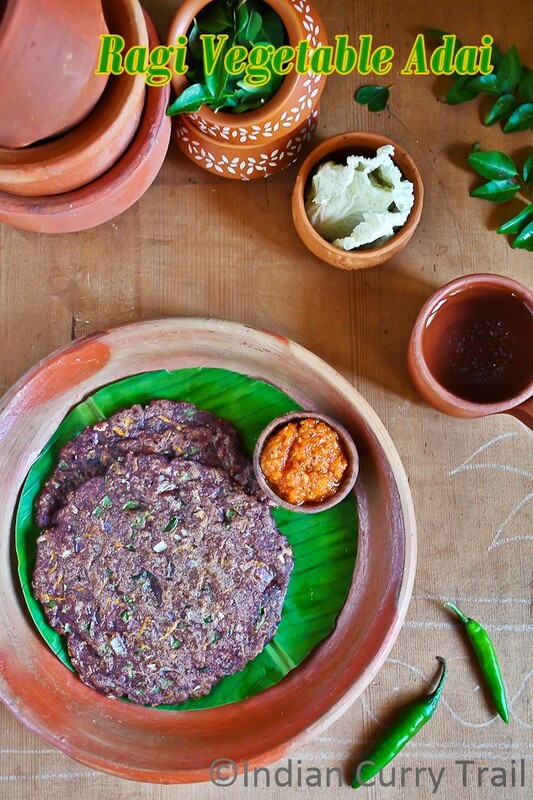 2) Traditionally, the ragi adai is pat over the hot griddle. If you find it difficult to handle hot pan, you can use banana leaf or damp cloth or butter paper for patting the adai. 3) It stays good when served hot.